I've decided to participate in Jacquie's Spring to Finish challenge. The deadline is May 31 and I'm aiming to get both NICU donation quilts done, the plume quilt done, rainbow strings done, couple of squares a completed top, and the body of the bargello sandwich quilted. Last night in a burst of motivation I finished the plume top and the Portals on Arabia quilt. This top is about 66 X 77. It's supposed to be a twin, but looks fine an a full size bed. That lump in to the lower right is Wilson, by the way. The time has come to finish the rainbow strings quilt. It's meant to be a gift to my scholarship donors and since I'm graduating soon I need to get it done. Currently I'm stuck because I need 100 unique 2.5" squares for the border and as of today I am about 15 short. So, if anyone could stick a few squares in an envelope and send them my way, I would sure appreciate it. I need squares that will read as a solid in the ROYGBIV color wheel (plus pink) that I don't already have. It's unlikely our stashes will over lap much, but if you blow up this picture to full size you ought to be able to get an idea. I especially need reds, yellows, oranges, and purples. If you can help me out, leave a comment and make sure I can find your email address and I'll send you my address. This weekend was the big bazaar fundraiser for my university's Moms' clubs. I helped out my mom's club, we did almost $2000 of business in $1 raffle tickets! That's money that will go toward scholarships for future students. Quilted items were popular; I picked up this bluebonnet wall hanging and a quilted ornament. The bluebonnets can be quite stunning this time of year. Happy Sunday, hope you're looking at a good week! Okay, so this is seriously belated, but this past weekend these great fabrics arrived from Sheree of Sheree's Alchemy blog and shop. I won her spring fabric giveaway for 10 fat quarters. Aren't they great? Such big bold prints! That black and green print on top is my favorite. Her little note card even matched the fabric. The other winner was a kindred spirit, her blog is called "My empty nest is full of cat hair". There hasn't been much sewing happening here lately. I know which projects I want to be working on, but some days it's just so hard to make it to the sewing machine! I made a couple of these in January, and I had started to post this once before but didn't because I couldn't figure out a way to accurately represent what it is. This time, though, I've found a video of one in action! What it is is a toy. A highly addictive folding, rotating block toy. There are apparently patterns available at some stores to make these. I developed a pattern from a photo of a completed one someone posted on their blog and my memories of playing with wooden and plastic ones. If you follow the links through from that video you'll come to a tutorial for making one of these completely by hand. My method is almost completely machine stitched, allowing for stronger and nicer looking seams. If I can ever figure out how to render the pattern into something two dimensional that someone else could actually understand I'll post it here. I've made a couple of these and have the pieces for a third cut out. As you can see, I'm still in the prototyping phase. I need to get a different foam to fill the blocks so they will lay better. Even so, it's downright fun! This is actually one of the quilt-y things I am most proud of. I went home again this weekend and spent some time quilting on the bargello quilt. It is not as difficult as I feared it would be. Once I have the appropriate thread colors and a few weekends to kill I should be able to get it done. I also laid out the Plume top and mostly sewed it together. I'll post pics of it later, once I finish the top. Right now I have a Spanish test to prepare for. So I've been out of the loop for almost a week. Four consecutive all-day's at work plus my thesis deadline (Friday) have kept me busy and without much energy for quilting. 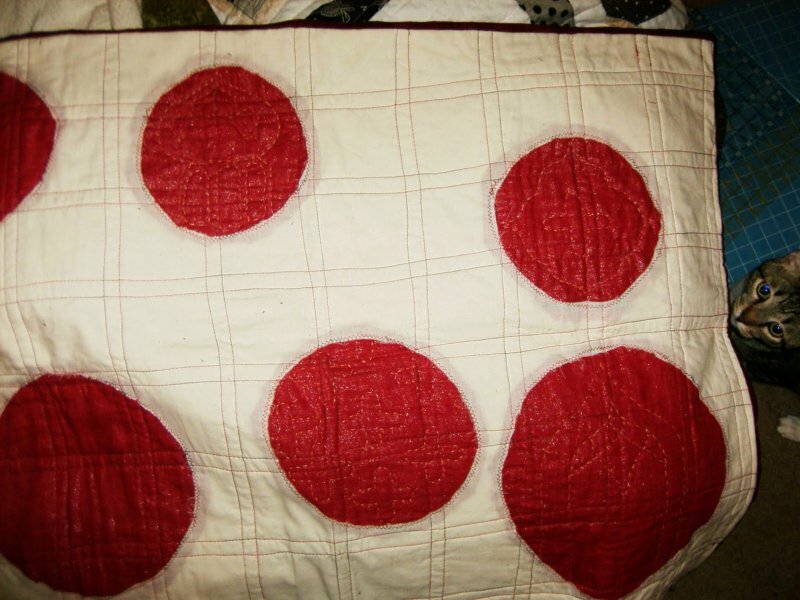 I have decoratively hand quilted several more 'portals' on the NICU donation quilt I'm calling "Portals on Arabia." There are two left to go. I tweaked the color to try and make the quilting show up better but the metallic threads in the linen just obscures it in the photo. I turned a stack of 42 10" layer cake pieces into 42 of these 9.5" (plus sashing makes them 11.5") blocks over the last few days. I decided that I need to finish something or else I'm going to lose my quilting momentum; I haven't had a finish since the Whirligig quilt and all my current major projects are stalled due to factors beyond my control. 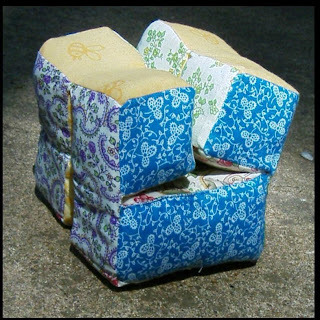 I had already decided the I wanted to mimic this quilt with the Plume layer cake that I absolutely couldn't resist. It's not my normal style but I chose it because the Plume fabrics have such beautiful, large motifs I didn't want to chop it up. Plus it'll be a really quick finish and it will be nice to hold a freshly washed, completed quilt again. The sashing is fine ribbed corduroy. I made sure that the ribbing runs long ways on all the strips so that it feels nice to pet. This is going to make a twin size quilt for a little girl and should be finished within the next week or so. Wilson has been taken off crinkly ball probation and is enjoying his reward, as you can see. PS- I wanted to share this post I ran across on Quilterblogs about a great thread and odd-and-ends storage system. I immediately made a trip to Walmart and found these double-sided plastic carry-alls in the hotwheels section, as promised. You can't get better sewing storage for a more reasonable price! Hope your Easter is special! I'm fortunate enough to have a job I really love, but I think 12 hour days, 4 days in a row, would get anyone down. Ugh. One more day; I have Sunday off. Then maybe I'll do more than work and sleep.